The New Jersey cerebral palsy lawyers at the East Brunswick New Jersey personal injury law firm of Martin Kane Kuper LLC work hard on a regular basis for child and adult victims of cerebral palsy both in Middlesex County and throughout the state of New Jersey. Every case of cerebral palsy is unique to the individual. This is due in part to the type of injury, extent of injury, and the timing of injury to the developing brain. In many cases, this serious injury can be caused by medical negligence and medical malpractice. 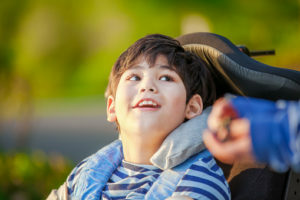 Martin Kane Kuper LLC, as experienced New Jersey cerebral palsy lawyers, are one of the few law firms that handles medical negligence and medical malpractice litigation related to cerebral palsy. This affliction can happen to anyone at any time and the trial lawyers in our East Brunswick New Jersey personal injury law firm have won large court-awarded settlements and verdicts for customers around New Jersey. Cerebral palsy is a brain injury or brain malformation that occurs while the brain is developing — before, during, or after birth. Because of the brain damage during brain development, a child’s muscle control, muscle coordination, muscle tone, reflex, posture, and balance can be affected. It also can impact a child’s fine motor skills, gross motor skills, and oral motor functioning. Please contact our East Brunswick New Jersey personal injury law firm at 1-877-468-3209 and tell one of our New Jersey cerebral palsy lawyers about your issue. The team of Martin Kane Kuper LLC lawyers will provide a true assessment – as part of a free, no-obligation consultation – of whether you should pursue your medical negligence and medical malpractice claim. When you contact our firm, you will learn more details about how our New Jersey cerebral palsy lawyers won large awards in such areas as surgical errors causing cerebral palsy as well as other instances of medical negligence and medical malpractice that has resulted in such issues as nerve damage, organ damage, infection, brain damage or death.